Here I have collected many of my old movie clips, that I have made over the years. I started making these in 2001, and they came on my web site in 2005. Handrolling is easy to learn when you know the basic eskimo rolls well. To enter your kayak after capsize and wet exit is a basic skill everyone paddling these crafts must learn. With a spare paddle and a sea sock this is EASY! See for yourself, and go try it! This is so important that we show it once more! Four times after another. This sure makes you dizzy! I did an experiment with underwater photography. Alexander Helberg from Krokstadelva demonstrates the "Pawlata" roll with his beautiful baidarka. A little paddling and maneuvering with camera attatched to the kayak. There are serveral ways to "rest" in the water, here you'll see some. A fine thing to learn. The water was really cold, so I got up as fast as I could! 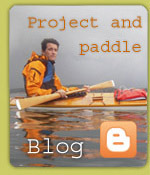 A stability test with a greenland kayak. We fixed the camera on a kayak just to see what happened!